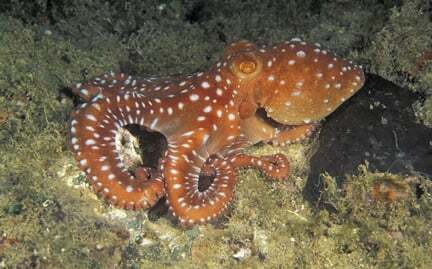 Living in holes or crevices throughout the rocky terrain of the world’s oceans, octopi feed primarily on crustaceans. They move by walking on the bottom or by swimming, usually headfirst, with arms trailing behind. They attach to any surface, including their prey, by using suction cups on their tentacles. They have a sharp, horny beak—similar to a parrot’s—in the center of their cluster of arms on the underside. Octopi are vulnerable to toxins and pollution.